SUPERIOR ANTLER SIZE AND MASS- Helps promotes antler growth by improving protein quality. The unique digestive tract of deer reduces the quality of most proteins by breaking them down too quickly and diluting their value for antler growth. AntlerMax® Protein Technology protects high-quality proteins from early breakdown and delivers a higher concentration to the growing antler. DEVELOPS EXCEPTIONAL BODY SIZE- High-quality protein helps build muscle for body growth. TOP REPRODUCTIVE PERFORMANCE AND HEALTHY FAWNS-Provides critical nutrients to help assure top fertility. Helps to increase milk production and milk quality. Helps produce strong, healthy fawns with high survival rates. 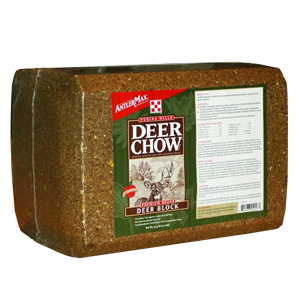 SUPPLEMENTS POOR OR SPARSE FORAGE- So deer can maintain vigor during periods of environmental nutritional stress. OPTIMAL ANTLER GROWTH, DENSITY AND STRENGTH- A power-packed nutritional package with ideal amounts and ratios of vitamins and minerals for optimal antler growth, reproductive success and enhanced growth. SUPERIOR ATTRACTANT AND HIGH PALATABILITY- Strong apple flavor attracts deer to the block so they receive the benefit of a balanced diet. OPTIMUM PERFORMANCE- Superior ingredients ensure high feed intake for optimum performance.